Keywords are a huge factor in your success or failure on eBay. Using the right keywords in your titles will let you charge more than your competitors, generate endless more sales and dominate your market even when you’re selling the exact same items. Recently we’ve seen so much TERRIBLE advice about keywords that we’re creating this article to tell you the truth. No, you don’t need to optimize your keywords for the most views (this is pointless). No, ranking highly for generic, one word keywords won’t help you. And no, this doesn’t have to be as hard as people try to make it. It turns out that running a dropshipping business is actually very similar to running a shop, so to show you this, let’s play a game. Congratulations, on being the proud owner of a new luxury jewellery shop! Feels good to have a shop full of diamonds, doesn’t it! This shop is all yours! Now what? Like dropshipping, to make a profit you buy your jewellery from your suppliers for a low price, and resell it to your customers for a higher price. Those are the basic rules of trading. Because you have a physical shop, it’s obvious that you’ll only succeed if you get lots of paying customersthrough your doors and buying your jewellery. So let’s say you have to decide where to locate your shop. Okay, this is a trick question! Visitors are not paying customers. 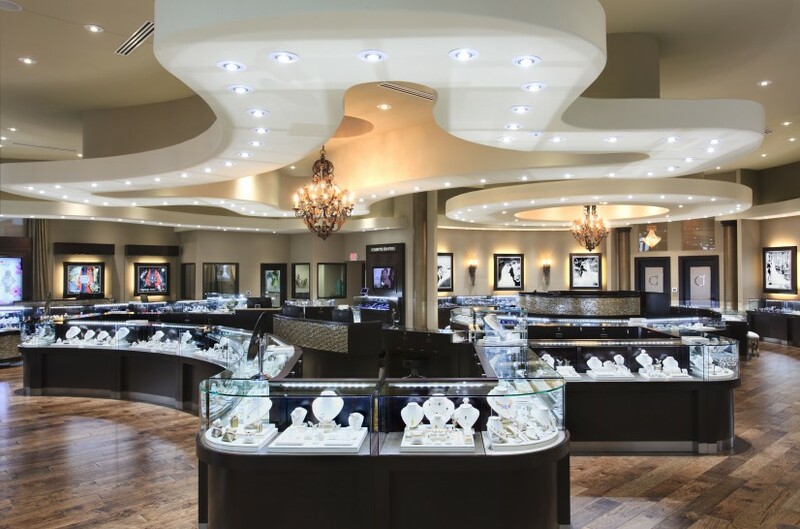 If you place your luxury jewellery shop somewhere that will attract 200 poor visitors, you’ll have 200 'window shoppers' that will just view your jewellery but can’t afford to buy - and you’ll get 0 sales. But if your shop is located in a wealthy area, you might only get 100 visitors but 10 sales. The quality and relevance of the visitor matters. The same principle holds true on eBay - you should only care about attracting paying customers to your listings, not necessarily the most amount of visitors. On eBay, your 'location' is determined by their search engine (Cassini). When a buyer types in a phrase like 'iPhone 64gb', the search engine chooses whether to display your listing on page 1 or page 41. And eBay’s search engine chooses where to place your listing partly based on the keywords in your titles. IMPORTANT: The biggest mistake that eBay sellers make when optimizing their titles is to choose keywords based on what is getting the most viewers, not what is getting the most buyers. Remember - the keywords in your title could mean you rank page 1 for 'iphone black 4' but page 20 for 'new iphone black'. We only care about ranking highly for search terms that are relevant and will get us sales. eBay is a software, and to win on eBay you’ll need to be an expert in SEO keyword research which is what this article will teach you next! Here’s our quick, easy 10 minute video showing you the exact process to finding the best keywords for your eBay listings. Want to get swarms of buyers on your eBay listings? Building titles with relevant keywords is one part of creating a profitable dropshipping business, but you also need the right software to uncover profitable items to sell and to optimize your listings. That's where ZIK Analytics comes in! Our software provides all the tools and support that you need to build a successful eBay dropshipping business. Interested? Click HERE to join our family of 3500+ eBay dropshippers! You always have to be thinking like a buyer when you create a title for your listing. So specifically, you need to think - What would a buyer be typing to search for your product? So what are long-tail keywords? Simply put, long-tail keywords are usually 3 or 4 keyword phrases that are very specific. If you’re a buyer, you’re not very likely to just search for ‘iPhone’ because you’ll get a huge amount of search results, including all different types and colors of iPhone that you aren’t interested in. And if you’re selling an ‘iPhone 8 64gb gold’, you’re unlikely to be concerned that you appear on page 67 when someone searches for a generic keyword like ‘iPhone’ because they’re highly unlikely to be a relevant, potential buyer. With all the different types and colors iPhone, the chances that the person on eBay was looking for your ‘iPhone 8 64gb gold’ is very small! Instead, make sure that your title starts with a strong long-tail keyword phrase, as it helps your listing become more relevant to eBay’s search engine. As well as that, long-tail keywords work well because they are less competitive and this helps you automatically get a higher search ranking for search terms that matter. The first thing we need to do is some initial keyword research to get a feel for the niche. For your item, look for the long-tail keyword that you think buyers are most likely to be typing to find it. For this example, I’d suggest that 'weekly meal planner' or 'weekly meal planner whiteboard' are the most common phrases. Type your long-tail keyword into Amazon and eBay. Then spend 2 minutes looking through other similar product titles for trends and patterns. This works particularly well on Amazon because sellers on Amazon often invest a lot more time and money in title keyword research than eBay sellers! Make sure your search is set to 'all departments' too! 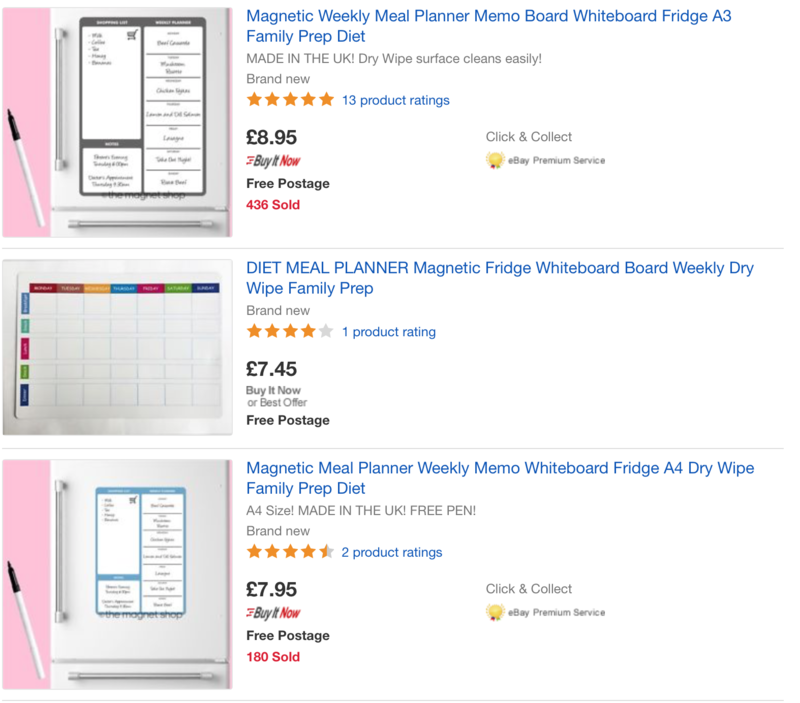 In addition to ‘weekly meal planner whiteboard’ - notice how they all these listings use the keywords like ‘family prep’? The top listing has sold 436 times and the bottom listing 180 times - these are good signs! Keep these keywords in mind, and now we’ll analyze our findings using ZIK Analytics. It’s time to use our findings, and combine it with market research from ZIK to build a hot selling, keyword rich title. Go to ZIK Analytics and put your long-tail keyword into the product research tool, then select the top 100 items, click 'ZIK selection' and go to 'Title Analytics' to start analyzing the market. With this we can start creating our title. eBay titles can only be a maximum of 80 characters, so ZIK has a handy feature where you can click on the different keywords to compose a title without going over the limit! 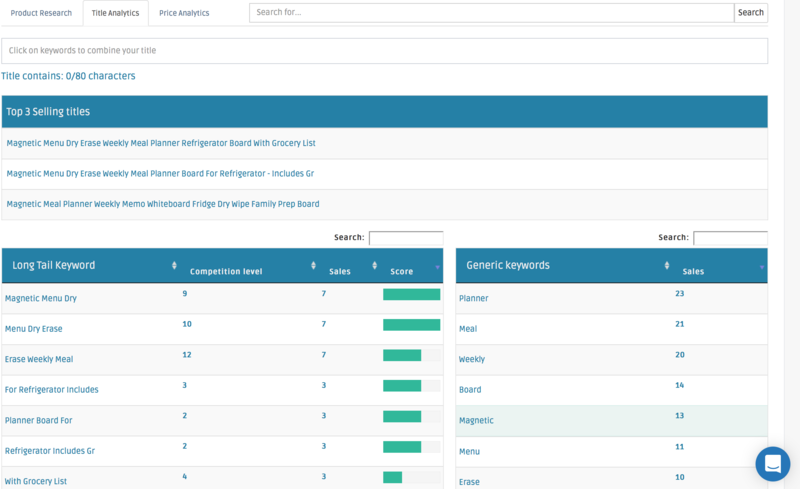 We can start by adding our original long-tail keyword to our title which was 'weekly meal planner' - it makes sense this will be a term that buyers will search for. Then, we can start looking for other best selling long-tail keywords. It’s very important to remember that we’re not just looking for long-tail keywords with a high amount of sales. We want to use long-tail keywords from ZIK that have low competition AND high sales. A long tail keyword that has 100 competitors and 100 sales might seem good, but actually a long-term keyword that has only 10 competitors but 75 sales would be more beneficial. It’s all about getting the right balance. Luckily, ZIK has a score column which makes it easier to analyze. It makes more sense for us to use 'Magnetic Menu Dry' than 'Dry Erase Weekly' because whilst they have the same amount of sales, the competition is far lower. Along with this, you’ll remember that we searched for keyword patterns on Amazon and eBay. One of the long-tail keyword trends on high selling versions of this item was for 'family prep' so we can consider adding this to the title too if we have room. Once we’ve found all the long-tail keyword phrases, we can add some creativity (read this to learn more) and look through ZIK’s suggested generic keywords to finish the title off. Once you’ve done this, you should end up with the PERFECT title, optimized for high sales (not high views!). Take a look at the title we created! Now it’s time for some final checks. Make sure to check that the keywords you’ve used are appropriate for your product. It’s no good selecting the keyword 'magnetic' if the item isn’t magnetic, you’ll just get buyer complaints and returns! Equally, consider if there any other keywords that *are* particularly appropriate for your item. In this case we might consider adding ‘refrigerator’ as it’s a high selling generic keyword and our item (particularly in the pictures) is designed for use on a fridge! Remember to sign up for our 7 day trial to get all the tools you need to find best selling items on eBay!